We’re in the news, around the world, our team and community are growing. Welcoming four new team members, completing our Asia tour, and announcing more details of the Partner Network on Feb. 28. Every year Goldman Sachs selects two areas of interest for its investors. This year, the areas were blockchain and e-sports, and AirSwap was chosen to represent blockchain. Sam Tabar spoke with other industry experts on a panel about benefits of a decentralized global marketplace. Our trip to Japan in late January included meetings with potential partners. 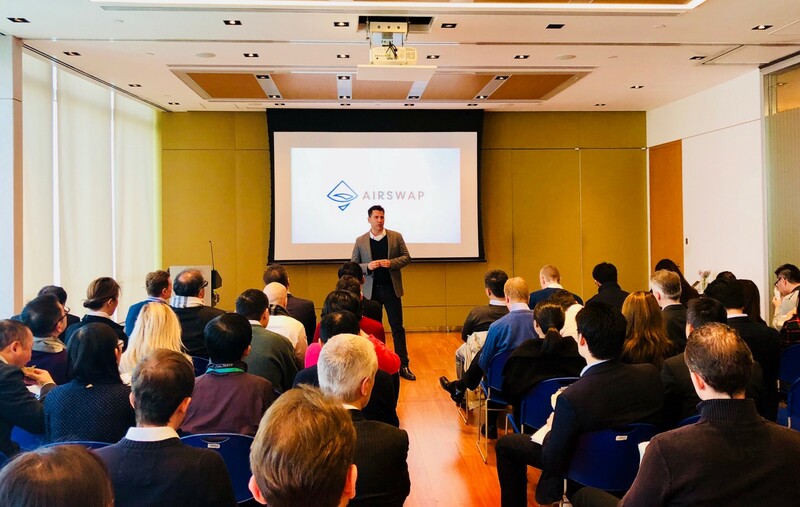 One of our missions was to educate these teams on AirSwap’s technology and why our approach to a decentralized global marketplace is more favorable compared to those of others. The tech scene is Hong Kong is burgeoning, and enterprises are taking notice of blockchain. BNP Paribas invited us to speak to a group of interested professionals. The last leg of our Asia trip in February was a meetup presentation at Ethereum Hong Kong at Kenetic Capital. The community showed up and asked fun questions. If you have more questions, join our Telegram chat! Following the awesome DEX workshop in Berlin, AirSwap and the Web3 Foundation hosted a meetup with our friends at Paradex and Herdius. For their first time covering the concept of decentralized marketplace, Financial Times featured AirSwap. Amid the many hacks of centralized exchanges in the first few months of 2018, the benefits of decentralized marketplace and AirSwap were highlighted in this piece. Similarly, Bitcoin Magazine featured AirSwap in this article to discuss the reasons why decentralized marketplaces can solve the issues inherent with centralized exchanges. In particular, in 2018, we believe a liquidity migration will flow from centralized exchanges to decentralized marketplaces, where an increasing portion of the trading action will occur. Nicole has led global marketing campaigns for brands including Google, Intel, Audi and Cirque du Soleil. She co-founded Breed, an agency geared towards launching startups such The Drone Racing League, she served as Vice President of Brand Strategy at LeadDog for over a decade and has won a host of industry awards including Reggies and Tellys for her creative strategies. Anish has over 15 years of combined engineering experience with both Wall Street and consumer technology. Starting his career at Deutsche Bank supporting IR Swaps market making desks, to more recently serving as a frontend specialist for consumer tech brands such as DirectTV, Discovery Channel, and MLSSoccer.com. He holds a BS and MS in Computer Science from Cornell University Engineering. Calvin is a creative technologist with a background in product engineering. Previously at Skillshare, he was a multi-disciplinary engineer, having worked on everything from product identity to infrastructure. Calvin graduated from UCLA with a B.S. in Computer Science. Brian has been a long-term oriented investor for the last 15+ years and is currently the Managing Partner of BXV Capital. Previously, he was Managing Director at Crestwood Capital, where he led long/short investments in software, technology and payments. Prior to Crestwood, Brian was the Founder and Managing Partner of Strategic Value Capital, a concentrated investment vehicle formed in partnership with The Parthenon Group, a boutique strategy consultancy where Brian began his career. He is graduate of Harvard Business School and Williams College. We’ve heard time and time again from newcomers about how our community is more educational, informative, and helpful than so many other project groups they’re a part of. We’re giving big shoutouts to Evolve, Rick Sanchez, Steve C, Deng-Fu Hsiao, Ranguvar, Kate Collins 💖, Jenny Vatrenko, Domi, Nick V, Sean, No Way, and One Man, for being awesome and helpful to everyone in the AirSwap community. We also thank Komninos and Hong Justin for always keeping us on our toes 😉. Thanks all for your passion and dedication.